YORK – Debra Fowlkes [...] — an avid Star Wars fan who routinely makes public appearances dressed as Aurra Sing, a red-headed, gun-toting bounty hunter from The Clone Wars — celebrated her 40th birthday Saturday with a few of her favorite clone villans. Fowlkes transformed her Yorktown home into a movie set for Deb*Con 40, her Star Wars-themed birthday party. Kites shaped like Star Wars starcraft, including the Millennium Falcon and X-Wing fighter, dangled from the ceiling. Cardboard cutouts of Star Wars characters — Aurra Sing, Cad Bane, Luke Skywalker and R2-D2 — hang out in the backyard with real characters in costume. "The only reason I'm not in costume because I thought it would be hard to hostess carrying a six-foot rifle and with an antenna sticking out of my head," said Fowlkes, a member of the 501st Garrison, the state's chapter of the organization that constructs and wear screen-accurate replicas of Imperial stormtrooper armor, clone troopers and other Star Wars villans. While some guest may show up in costumes loosely based on Star Wars characters, 501st members have to meet Star Wars standards and have them approved by the organization before they can dress in character, Fowlkes said. Fowlkes fell in love with the classic sci-fi franchise after she saw the original movie in 1977, as a child in Sacramento. "It was the specials effects that blew me away," Fowlkes said, especially the use of clay animation and makeup. Although they only brought their helmets to the party, Fowlkes' fellow 501st clone troopers said they appreciate opportunities to share their love of science fiction. "We're just big kids," said 28-year-old Jason Tuttle of Norfolk. "People of all ages love Star Wars. This is a chance to share something we love and put a smile on people's faces." Q: How did you come up with the idea to do your own Star Wars party? A: Actually I had wanted a Star Wars themed wedding but I knew that wasn't very practical. So, I decided that one of my "BIG" birthdays I would have a "Star Wars" party. Then about a few years ago on the [Ace of Cakes] show, they did an R2-D2 life-size cake for George Lucas. It was for the completion on the [second] season of "The Clone Wars" series. When I saw that cake, I knew I wanted that cake and what I had to do!! 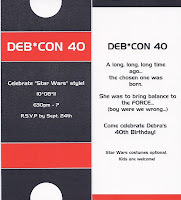 The "DEB*CON 40" idea came to me because I go to SyFy conventions like ComiCon, NekoCon, SW CV, etc. I wanted the invitations to look like people were being invited to a "con," not just a typical 40th party. Q: The article mentions SW kites and cardboard standees. What else did you have going at the party? Any Star Wars food or cake? Any Deb*Con T-shirts or memorabilia? articles from "Star Wars Celebration V" which was held in Orlando, FL August 2010 that I attended. The main focus of the party was the cake! I had to have the R2D2 cake! I did contact the "Cake Boss" however, their cakes start at $1000. I couldn't fit that in the budget. The FORCE was with me when I found online a picture of a "Yoda" cake and read that they were in Newport News, VA. "Taste & See" Cakery, those ladies are AWESOME!!! I have a R2D2 fish tank about 3 feet tall that I took to them and said..."this is what I'm looking for." And they went above and beyond! They even put fiber optics in the dome of the cake! I never even asked for that! That was the highlight of my party! I wanted to make everyone a T-shirt but the cost was too high. However, I did make myself a "DEB*CON 40" t-shirt that read "SITH MOM" on the back. I did have a few souvenirs made for my guests though. When guests arrived, 2 of my daughters handed out a program and a "VIP DEB*CON 40" badge. I also had personalized M&M's that had (DEB*CON 40) printed on the red M&M's with black and white ones made. Had them in souvenir boxes on all the tables. Q: The article mentions you had the 501st over, but only in helmets. Why no full costumes? A: Some had been rebuilding their armor, others couldn't make it. Our costumes go through a lot with all the events we do for charities, especially those with the armor, there's touch ups here and there. 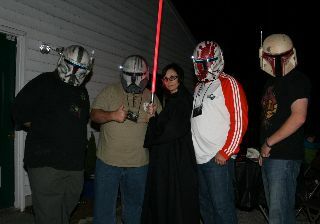 Some of my non-501st friends came in costumes they made just for the party which really meant a lot to me. Q: How many people were there? Friends, family, non-Star Wars fans? A: I invited 90 and about 82 showed. Q: Are you planning to throw another Deb*Con next year? A: Not next year. I have tickets for "Star Wars Celebration VI" held in Orlando, FL again in August 2012! I did think about having a "DEB*CON 45" though...ha ha! If you're wondering why we didn't ask her about her work in the 501st, don't worry. Check out part two! 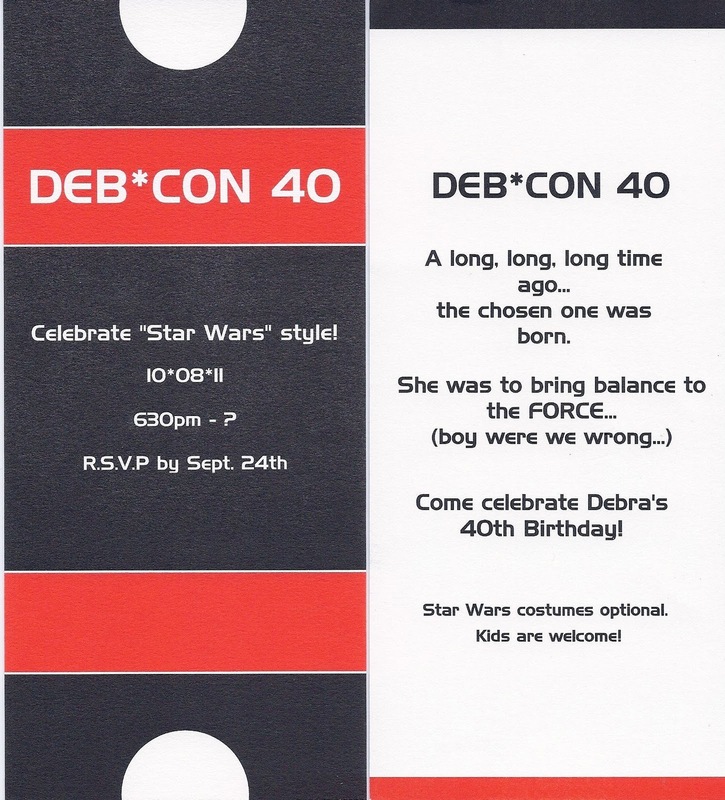 Would you have shown up for Deb*Con 40? Eighty-two showed? That's good odds. A Star Wars wedding would be odd, but for a fortieth birthday celebration, that sound perfect.